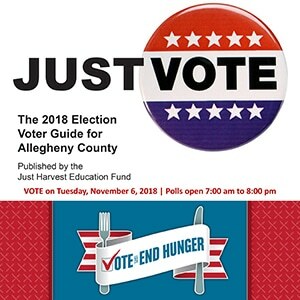 On Nov. 6, voters in Pennsylvania’s 39th House District will have a choice of two candidates for state representative: Robert Rhoderick (Democrat) or Michael Puskaric (Republican). Rep. Saccone (R) vacated this seat to run for Congress earlier this year. This district comprises the TOWNSHIPS of Elizabeth, Forward, South Park, and the BOROUGHS of Bethel Park (WARDS 02, 03, 09), Elizabeth, Jefferson Hills, and West Elizabeth. It also includes part of Washington County. 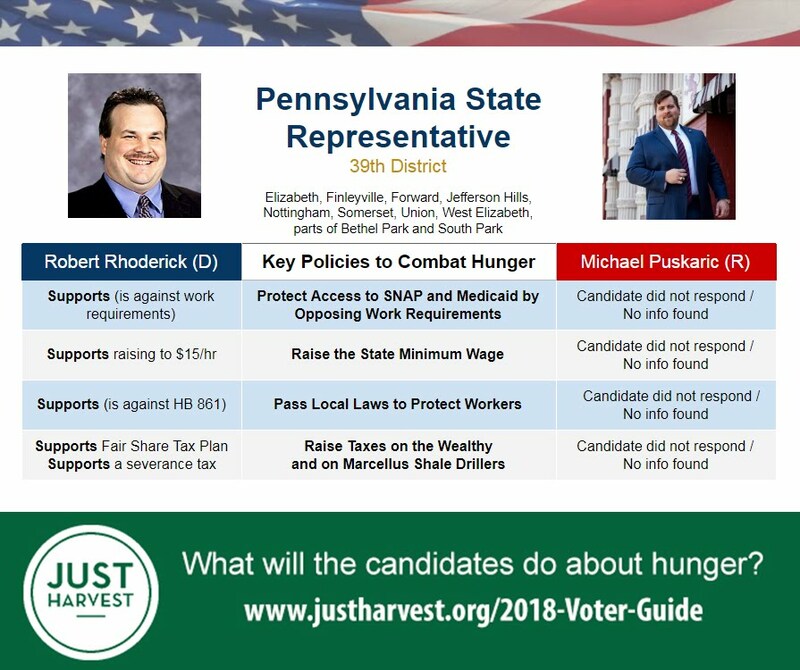 We asked each candidate five questions about their stance on key policies to combat hunger in Pennsylvania. We did not receive a response from Puskaric despite multiple requests, and were not able to determine his position based on public statements. Rhoderick’s full response is below the graphic. As a chiropracter by trade, I know that many people face obstacles to work. I would not require work to be a part of recieiving assistance. I believe we can eventually reach $15 an hour, however, I think it will take electing more Democrats. No, HB861 is a thinly veiled effort to strip protections from workers and LGBTQ individuals extended by local governments because state and federal I am against HB 861. I would support the Fair Share Tax Plan. Yes, provided the money is used to pay for education. Also, I do want to see the severance tax used to replace the impact fees. I believe communities still need the impact fees to pay for any infrastructure that sustains damage due to gas industry.